[muhf-fuh-LEHT-tuh] A specialty of New Orleans, this sandwich originated in 1906 at the Central Grocery, which some say has been ruined by publicity. Better muffulettas are created two doors down at the Progress grocery, or for atmosphere, at the nearby Napoleon House. It can be found from Lafayette through Baton Rouge and the Mississippi Gulf Coast. It could be made anywhere the you can get a good ten-inch round loaf of Italian bread. The sandwich consists of the round loaf of crusty Italian bread, split and filled with layers of sliced Provolone, Genoa salami and Cappicola ham, topped with Olive Salad, a chopped mixture of green, unstuffed olives, pimientos, celery, garlic, cocktail onions, capers, oregano, parsley, olive oil, red-wine vinegar, salt and pepper. 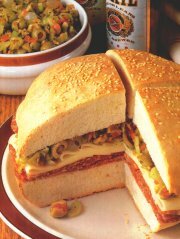 The muffuletta is as much a signature sandwich of New Orleans as the roast beef po-boy. New Orleans doesn't have a "Little Italy" section of town that you see in many other cities, but we have a large Italian community and lots of Italian restaurants. The passion for eating and good food that immigrants from Italy brought to this country meshed well with the Creole traditions already here in New Orleans. The muff looks at first glance like an easy sandwich to make, but that ingredients list is much more complicated. The two crucial items are the bread and olive salad. You can buy good quality meat and cheese in most supermarkets; good olive salad is another story. Good Italian bread is another problem. In New Orleans, most of the french bread bakers also do Italian bread. Most of the places that do muffs buy their bread from Angelo Gendusa's. God is Good - But never dance in a small boat. 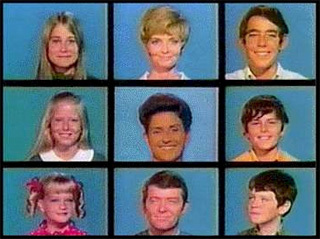 Get your very own Psalm hand-picked by Joesus and delivered straight to your Palm Pilot every week by signing up here.